This highly reflective vest is the perfect tool to brighten up your outdoor activities. Many of these accidents could have been completely avoided just by wearing simple high visibility clothing, such a reflective safety vest. safety you need so that you can feel safe and at ease, in any low visibility situation. It will keep you seen, anywhere, anytime! Powertiger is a new team in the Amazon, thank you for your choice. please conduct a comprehensive review us an email. ★ HIGHLY REFLECTIVE: 360° reflectivity and visibility hi viz reflective vests to be seen in any weather condition at day or night. Crafted using high quality SILVER reflective material (BEWARE of competitors' using inferior reflective tape). 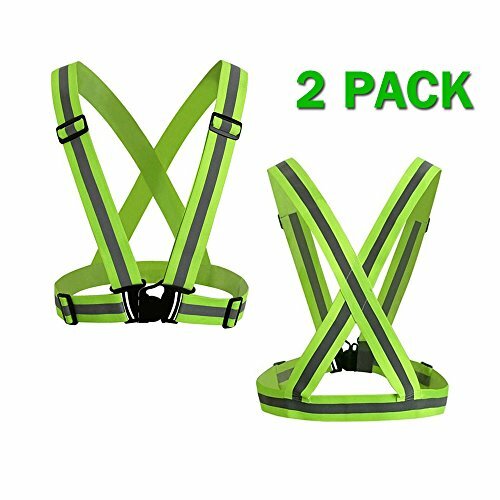 ★ UNLIMITED VERSATILITY: High visibility suspender type reflective harness vest for ANY outdoor activity; including running, cycling, walking, jogging, construction or traffic work where high vis Reflective Vest is required. ★Quality Guarantee:If you have any question with the item,please contact us , we will reply within 24 hours. We offer an 30-day money-back guarantee, if the purchase has any quality defect. Please be assured the purchase. If you have any questions about this product by Power Tiger CAR ACCESSORIES, contact us by completing and submitting the form below. If you are looking for a specif part number, please include it with your message.